I saved one of my favorite topics for (nearly) last. There is no question that location can play a major role in many investigations. iOS location data as changed drastically with iOS 11 from previous iOS versions. I published research on these locations in the past and parsing scripts. It is my goal to update these scripts with this new research soon(ish). The CurrentPowerlog.PLSQL contains some useful metadata associated with the primary locations data I’ll discuss a bit later in this article. The powerlog_location_tech_status module contains a log of how location was determined. Was the location determined by Wi-Fi or GPS technologies? This information can contribute to how accurate the location data may be. The powerlog_location_client_status module appears to keep track of which applications and services are requesting location data. Some app examples below include Waze, Weather Underground, The Weather Channel, and the AUDI app. The services can be seen in the second screenshot (the data contained in this table was too long for only one!). The type of location is also recorded along with accuracy figures. I’ve seen the following types. 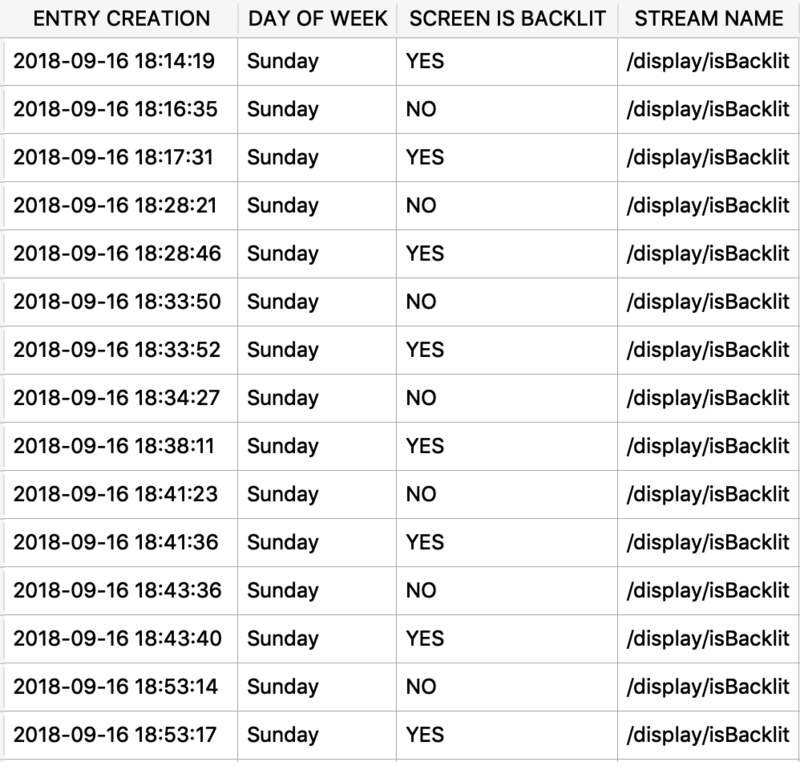 Finally, we have a small log of providing time zone context to the data. The powerlog_timezone module will extract this information. As I’ve mentioned above, the storage of the routined process locations and Significant Locations has changed dramatically in iOS11 from previous versions. These databases are stored in the following path and are only accessible in full file system dumps. The first database, Cache.sqlite, contains an extremely detailed history of coordinates where the device was. In my own data I had over 40,000 (!) data points. This data is stored for just over a week. This can provide a very accurate map of where I was during that last week. The routined_cache_zrtcllocationmo module can extract these coordinates along with a timestamp, altitude, course, speed (meters/second), and vertical/horizontal accuracy figures. Also kept for about a week is data extracted with the routined_cache_zrthintmo module. It has fewer data points, but the timestamp and coordinates appear to be accurate. The next few modules all use basically the same query but are keyed off of different timestamps. The example shown is of the first module. Again, this screenshot was split into two because of the amount of data provided by this table. Each significant location visit contains various timestamps (visit entry/exit, visit creation/expiration, learned place creation/expiration). Each visit has coordinates along with a Place ID (an identifier for a specific location), data points collected for that place, uncertainty and confidence figures, and device logging information. In the second screenshot there are two odd looking columns, Place Name BLOB and Place Geo BLOB. Each of these columns is storing BLOB data in hex format. I chose this format as it is easy (relatively) to copy/paste into a hex editor for viewing. Examples below. 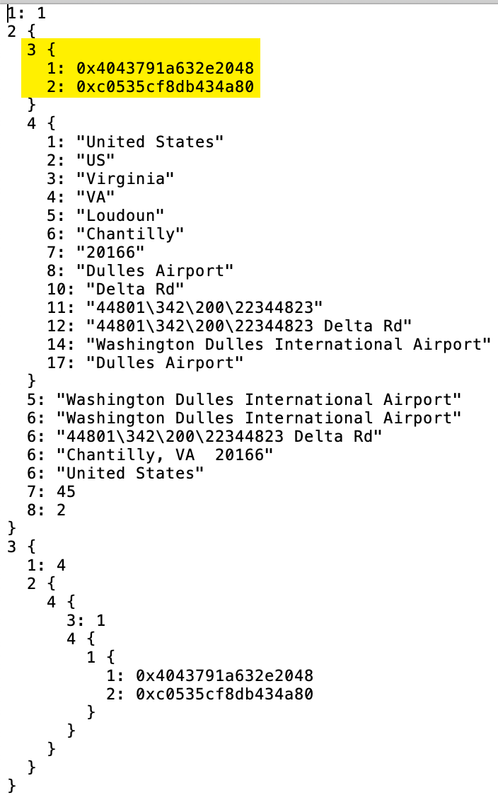 The first column “Place Name BLOB” contains a smaller amount of binary data (than the Place Geo BLOB), and as you can see you can fairly easily determine where I was at this time – Dulles Airport (I’m a frequent visitor there as you can imagine.) You get address, city, state, business name information in this blob. The second column “Place Geo BLOB” contains much more binary data, but you can still pick out some similarities in the strings. So here is the kicker – for YEARS I just accepted these BLOBS, tried to parse them and was unsuccessful but didn’t care too much as I could always see the contents of them. While putting this article together I finally discovered their format – it’s a Christmas miracle! It worked! I finally have a parsed data structure, granted some of the protobuf pieces I still need to determine but its certainly further than I’ve gotten before. Below is the protobuf output for the “Place Name BLOB”. Many of the strings are obvious, however the highlighted section is the coordinates for Dulles Airport. These are 8-byte floats stored in big-endian as shown in the hex editor below. The “Place Geo BLOB” is quite a bit lengthier, too long in fact to create a decent screenshot of but still contains the string data and coordinates as expected. Ok back to Significant Location databases. There is one left, the Local.sqlite database. This contains similar data to what we’ve seen before. Timestamps, coordinates, confidence, uncertainty, data point count, and (protobuf!) BLOBS. As with the other modules, they query is basically the same but is using different timestamps to key off from. The example is from the first module. These screenshots are also from the same query, too long to post as a single screenshot. The last piece of location data I’m extracting from the Local.sqlite database is parking history. I connect my iPhone to my vehicle via CarPlay so I’m not sure if this is required to populate this data. The first module routined_local_vehicle_parked shows the last location of my parked car. The routined_local_vehicle_parked_history module shows a parking history. These modules should give you a pretty good idea where a certain user’s device was a given moment. It is worth mentioning the data does expire after a certain period of time, the sooner you have the data the better the data will be for you. Historically it appears to be pretty accurate but significant locations, but it doesn’t have every location. Dump that phone ASAP! Santa can easily find where you live. Creepy Santa. The interface of the device can produce some useful artifacts. Starting with screen orientation. Perhaps you want to know if the user was watching a video for a period of time. In conjunction with other artifacts that I’ve already details like app usage the knowledge_device_orientation module will show if the screen was in landscape or portrait mode. The knowledge_device_is_backlit module will let you know if the display was backlit or not, this is different than if the device was locked or not – perhaps the user was just checking their messages without unlocking the device. Moving to the Powerlog, we can use the powerlog_device_screen module to see what “screen” the device was on. I’ve researched this one a bit and on my iPhone7 on iOS 11. These are the “screens” I was able to determine. Perhaps the how light or dark the environment is can help you in an investigation. The Powerlog stores the screen brightness. The lower the brightness, theoretically the darker the environment is where the device is, especially if the auto adjust feature is on. The powerlog_display_brightness module can output this data. 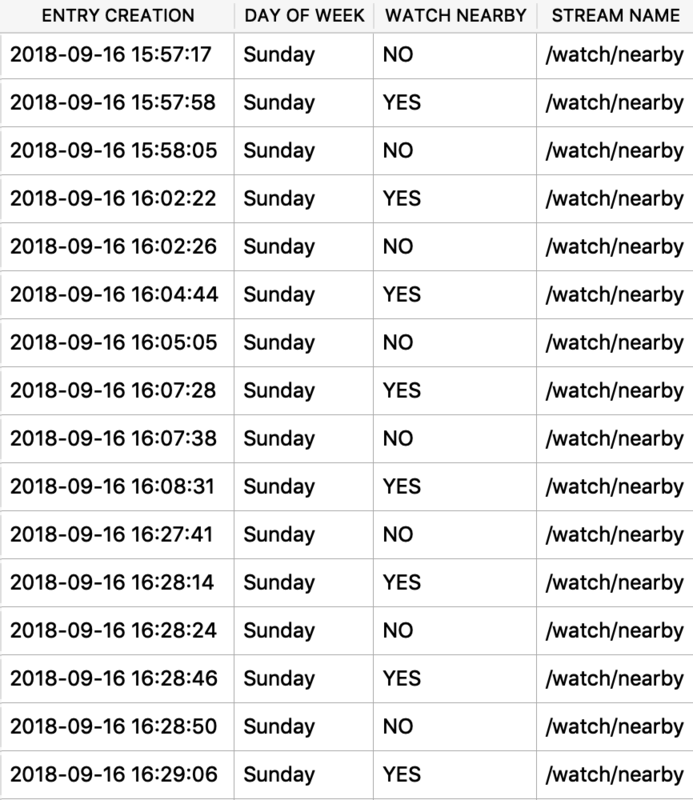 The next two modules powerlog_springboard_aggregate_bulletins and powerlog_springboard_aggregate_notifications] are some modules that I’d like to research more. I believe these are the notifications that are presented to the user for each application. However, I don’t know yet what the differences between a bulletin and a notification yet. Today we’ll be analyzing the knowledgeC.db and CurrentPowerlog.PLSQL database for various connections. The first thing you may want to know in an investigation is – was the device plugged in or not? This can be gained from a few places. The knowledgeC.db database tracks this information and can be parsed out by using the knowledge_device_pluggedin module. This will keep track of the plugged in and unplugged states of the device and for how long each of those events were as calculated out in the ‘Usage in Seconds’ column. Similar data is captured in the CurrentPowerlog.PLSQL database. The powerlog_lightnining_connector_status module extracts the same events, however I have seen in my own data some slight oddities, like the plug in/unplug events every minute or so – almost like the cable was loose (it wasn’t). Take that observation for what it’s worth, at least we can corroborate with other data! Another option is the powerlog_accessory_connection module. This one also appears to be more accurate but I’m not entirely sure what all “accessories” would be covered. My own data shows connections to power cables, this would include my CarPlay connection. Speaking of CarPlay, we can extract that connection information using the knowledge_device_carplay_connected module. This output only has the initial connection, not the disconnect event. Next on the Bluetooth list is the Apple Watch. The knowledge.db database also keeps track if the device is near the iPhone to which it is paired. The knowledge_device_watch_nearby module will show if I walked away from my iPhone for a certain period of time. In the Powerlog, the paired Apple Watch information is stored. It not really in a log format but could be useful information. I have yet to determine the significance of the timestamp, it is not the initial pairing of the device. This can be extracted using the powerlog_paired_device_config module. Finally let’s look at Wi-Fi connections. The Powerlog is keeping track of each SSID that my phone has connected to, but the name is a bit odd, I’m still researching why it is using this naming scheme, ideas are welcome. The “SSID” is alphanumeric and always same length. The powerlog_wifi_properties module will extract this data. Today is all about the CurrentPowerlog.PLSQL database. This database keeps track of many ways that data is transferred either by cellular, Wi-Fi, or Bluetooth methods. 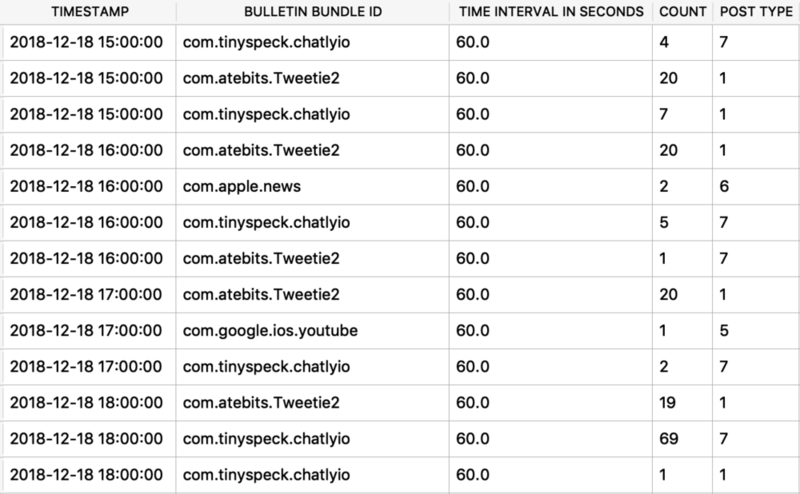 These modules can help determine where the data is going, which app is pulling down the most data, or simply keeping an eye on which apps are sending the most notifications. Starting with telephony artifact we can review the cellular registration using the powerlog_device_telephony_registration module. This outputs the cellular provider and the level of service provided. The powerlog_device_telephony_activity module will keep track of telephony activity on the device. In the screenshot below, each time the CALL STATUS shows ringing, I was receiving a phone call (that I ignored), but where it says ACTIVE, I made a phone call. Another module that shows call usage, is the powerlog_incallservice module.. Like the example above this shows me ignoring three calls (callForegrounded, callBackgrounded) and a call made (callStart, callStop). Mobile devices have network interfaces that track where the data is going. The powerlog_network_usage module keeps track of the incoming and outgoing bytes for these interfaces. If you want a bit more detail on which apps or services are using your precious cellular data, take a look at the output of the powerlog_process_data_usage module. This can make it easy to see which app is burning through your mobile data. (Mine is always Twitter). Many Apple technologies rely on Bluetooth technology to function. Determine what state Bluetooth was in is logged. Using the powerlog_bluetooth_device_state module, we can see which state it was in. AirDrop is one of the technologies that uses Bluetooth (also Wi-Fi), the AirDrop state is recorded and can be extracted by the powerlog_airdrop module. Continuity [https://www.apple.com/macos/continuity/] is a technology to move data back and forth between devices. AirDrop makes use of this technology. This activity can be extracted by the powerlog_ids_messages module. On this sixth day we’re going to go back to looking at the knowledgeC.db and CurrentPowerlog.PLSQL databases. If you are unfamiliar with these databases, please go back a few blogs. Today is all about what state the device is in. Let’s start with the battery level. This is surprisingly covered in a couple of databases and multiple tables in these databases, plenty of places to get this information. The first one is using the knowledgeC.db database with the knowledge_device_batterylevel module. This database provides the usage time between battery levels which may be used to determine amount of usage during a particular time period by the user or device. Similar is a couple of modules using the CurrentPowerlog.PLSQL database. These two have slight differences. The powerlog_battery_level_ui module just has the battery level as shown in the GUI, while the powerlog_battery_level shows additional information such as raw level and if the device is charging or is fully charged. The next state is if the device is locked or not. Again, we’ll start with the knowledgeC.db knowledge_device_locked module. Going back to the CurrentPowerlog.PLSQL database we have a couple of modules for the same stat. The difference between these is that the latter keeps track of devices locks if the device is using the timed auto-lock function, that “1” just shows that it is in a locked state. The first example shows lock and locked states. The next few modules are all random device states that may come in handy. The first is the button state. The powerlog_button_state module appears to keep track of which button are being pressed. I’m still testing this one, but this data came from an iPhoneX that has just the power button (apart from the volume buttons). I believe button 48 may be the power button as the timestamps seem to align with locking the device. The powerlog_camera_state module will keep track of which app and which camera is being used. This will truly tell how many duckface selfies you’ve taken. The powerlog_mobilebackup module keeps track of backup activity, in this case iCloud backups. This is real torch in my opinion.